A kitchen utensil that is used to open or remove the top from a metal can. There are a wide variety of different designs available ranging from manually operated small tools to automated openers that quickly and easily remove the top of the can. When selecting can openers, review the models available, evaluating the features that will be most important to consider. Some lower-priced can openers contain cutting blades and compression components that provide a rough edge around the can and the opened top that can result in cuts to the hand if not carefully handled. In addition, the cutting mechanisms may tend to become coated with grease over a period of time and as foods may come in contact with the residue a contamination of the foods being opened may occur. Also, many openers drop the lid into the can after the cutting blades have circulated completely around the can top, requiring removal by hand and exposing the contents to another source of possible contamination with both the can lid submerged in the can contents and the use of hands to retrieve the lid. As a better alternative to some of the older or less expensive models, consider Can Openers that are more effective at opening the can, which are typically referred to as Smooth-Edge Openers, Safe-Cut Openers, Safety-Cut Openers, or Safety Openers. Openers designed with more safety features produce a smoother-edged opening and lid as well, so the top insides of the can and the opened lid have smoother edges after the can is opened, unlike the jagged edges produced by some of the other Can Openers. 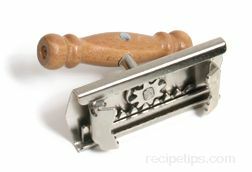 The position of the hand knobs to wind or turn the cutter blades - are they comfortable, cushioned and well positioned?